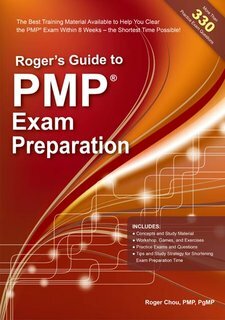 An in-depth guide for those preparing for the PMP® Exam, taking them through all the required areas of professional project management skills and knowledge. The guide’s author, Roger Chou, is a PMI certified program manager (PgMP) and project manager (PMP) who has trained over 10,000 people to pass the Exam in an average preparation time as short as 3 months. The guide’s usefulness comes from Roger’s experience of knowing how to guide students through all the required areas of knowledge. Each of the chapter includes short quizzes, concept explanations, mind-maps, comparison tables and charts, memory aids. The book works best with an online testbank patented by PM-ABC, which is very similar to the real Exam. These together will help you to prepare through the PMP Exam.